Some 190 sea lions were counted at the Bonneville Dam tailrace in 2016. These pinnipeds ate 9,525 spring Chinook and steelhead, or 5.8 percent of the runs. From January through May 2016, California and Steller sea lions took the largest portion of the spring Chinook and steelhead runs since the U.S. Army Corps of Engineers began documenting sea lion presence and consumption in the Columbia River. Some 190 sea lions were counted at the Bonneville Dam tailrace in 2016. These pinnipeds ate 9,525 spring Chinook and steelhead, or 5.8 percent of the runs. The Corps' report, released in February 2017, said a larger number of pinnipeds, some 264, were observed at the dam in 2015. But at 4.5 percent of the salmonid runs, the 2015 pinniped consumption of spring Chinook and steelhead was less than in 2016. 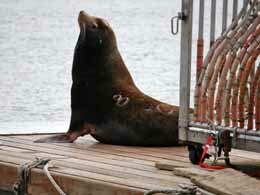 Sea lions also eat lamprey and sturgeon. The Corps recorded sea lions consuming 501 Pacific lamprey and 90 juvenile sturgeon in 2016. Steller sea lions start arriving at the dam as early as January, while California sea lions show up in March and peak in early May. By the end of May, most sea lions are gone, headed to coastal breeding areas. Some salmonids taken by pinnipeds are protected under the Endangered Species Act, including Snake River spring/summer Chinook. Earlier this month, a pinniped task force organized by NOAA Fisheries found that hazing sea lions was not discouraging the animals and should end except in the dam's fish ladders. Hazing consists of harassing the animals with gunshot warnings and loud noise. Exclusion gates installed at fish-ladder entrances and barrier gates at the second powerhouse's fish channel have deterred more sea lions than has hazing. According to the Pinniped-Fishery Interaction Task Force, the most successful prevention activity has been the removal of individually identified predatory California sea lions; Steller sea lions are ESA protected, and so cannot be removed. Since 2008, 166 sea lions have been removed, either by relocation to zoos or euthanasia. The task force will soon make recommendations to NOAA Fisheries that will be the basis of a potentially new course of action for sea lion removal.